Our itinerary has been developed to include the best and most interesting activities available in Iceland during the summer months. 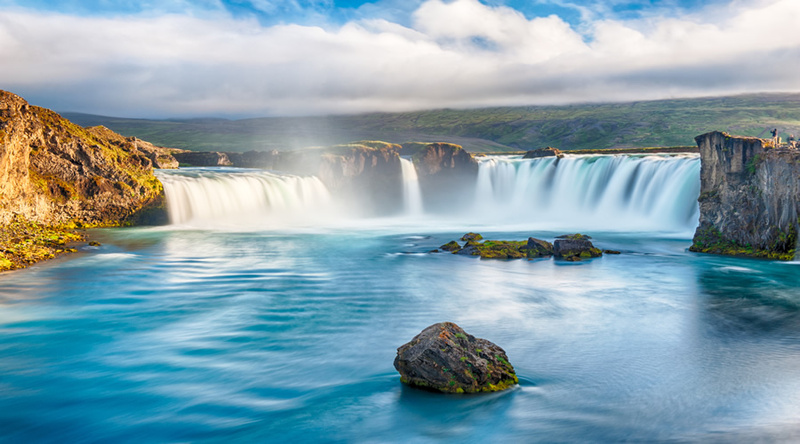 Begin your holiday in Iceland with a visit to the amazing South Shore of Iceland crossing fertile farmlands with striking views over waterfalls, glaciers and beautiful nature. It’s a great way to spend your first full day in Iceland. 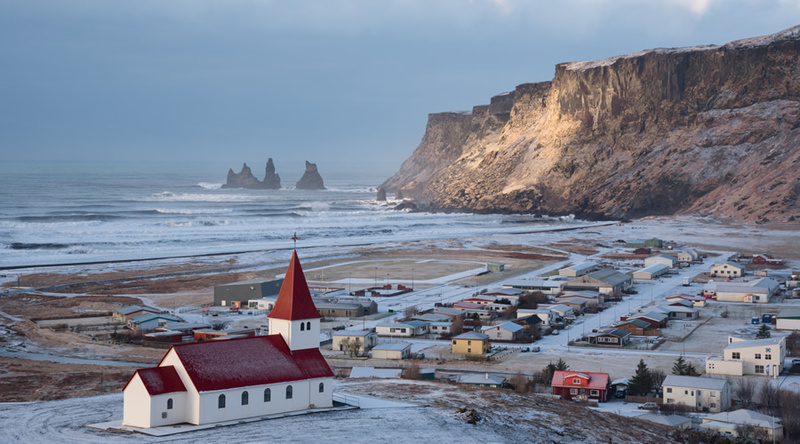 Drive along the south coast of Iceland, one of the country's most scenic regions, as far as Vik, a charming village surrounded by beautiful high bird cliffs. Along the way we stop at the gorgeous Seljalandsfoss waterfall, were you can walk behind it and through to the other side. 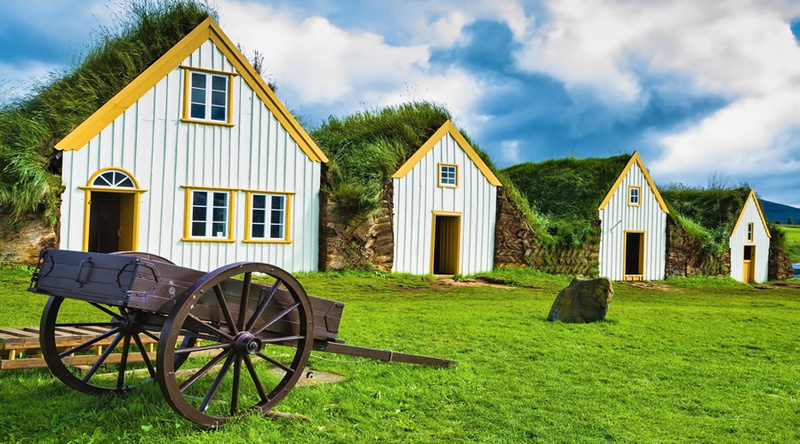 We also stop at the majestic and much-photographed Skogafoss waterfall, with its 60-metre drop, and visit the Skogar folk museum, to get a taste of how Icelanders lived in centuries past. Other highlights include views of the stunning Myrdalsjokull glacier, the black sand coastline and the impressive Reynisdrangar rock formations. One of the highlights of Iceland’s spectacular geography is the Golden Circle. We have arranged a full day tour where you will visit Thingvellir National Park, a remarkable historical and geological site, which is located by Lake Thingvallavatn, the largest lake in Iceland. The beautiful canyon running through the park is actually the meeting point of two of the earth's tectonic plates. Furthermore, it is in this area the oldest form of parliament had met since 930. Gullfoss waterfall is where you will see thousands of tons of icy water thunder majestically down in double falls into a deep canyon. The Geysir geothermal area is where bubbling hot springs and geysers are abundant. 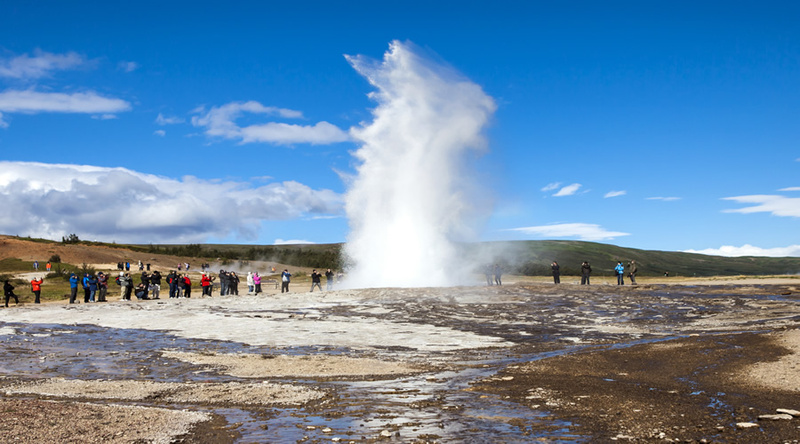 Here you'll also find Strokkur, the most active geyser in the area, spouting up to 25-30 meters into the sky. We visit the Reykjanes peninsula where you can see the mid Atlantic ridge rise from the ocean and more than half of the peninsula is covered with lava fields, some of which are only a few hundred years old. This is a magnificent area with rich bird life in the summer. First we head towards the community of Sandgerdi, one of the country's major fishing points. The tour continues along the coast line through Midnesheidi moor which rises up from the lowland. We will stop at the stone built church of Hvalneskirkja from the year 1887. The journey proceeds through lava fields onwards to Sandvik where two of the earth's tectonic plate split. At Sandvik you will get the opportunity to walk over a symbolic footbridge which crosses a fissure which provides clear evidence of the rift between the European and the North American tectonic plates. Continue to the old lighthouse on the westernmost tip of the peninsula. We will also stop at Gunnuhver, the country's largest mud pool. Pass through the fishing village Grindavík on the way to the Blue Lagoon. There you have three different options; a visit to the Blue Lagoon, transfer to Keflavik Airport or return back to Reykjavik. 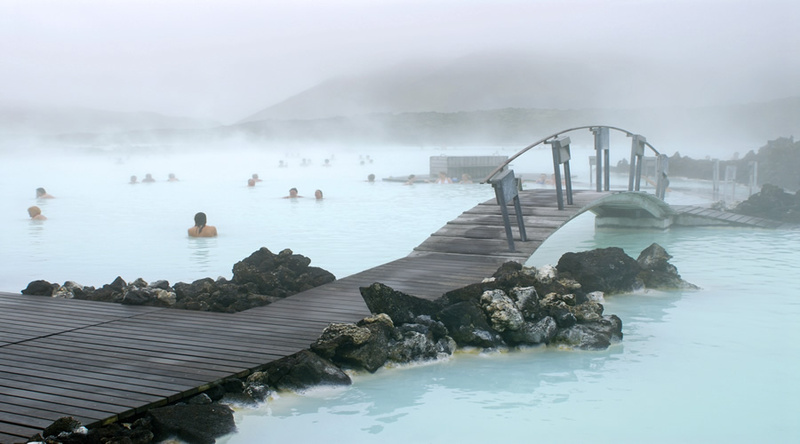 Enjoy a relaxing time at Iceland’s famous Blue Lagoon. The Blue Lagoon is known for its special properties and its beneficial effects on the skin, and attracts visitors from all over the world in search of health, relaxation and an exotic experience. The Blue Lagoon's warm water and natural active ingredients; mineral salts, silica and blue green algae help you relax and unwind while the lagoon's distinctive white silica mud gently cleanses and exfoliates the skin. The mineral salts balance and relax body and soul. In addition to bathing in the lagoon, guests have access to a sauna with a view of the lagoon, a steam-bath with white walls that resemble silica-mud and a cosy steam-bath carved into a lava cave. Guests can also stand beneath a small waterfall for an energizing massage. Of course, guests bathing in the milky waters of the Blue Lagoon have easy access to the famous white silica-mud, an essential part of the spa experience. 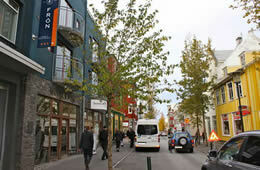 The Radisson Blu Saga Hotel, Reykjavik welcomes guests to the beauty of Iceland. An architectural landmark, the hotel sits in a peaceful neighborhood just 10 minutes from the lively city center. Explore the city’s museums, galleries and nightlife as well as the surrounding natural wonders. Comfortable amenities and beautiful views of the city, ocean, glaciers and mountains grace the 236 rooms and suites of this Reykjavik hotel. Guests can take advantage of buffet and gourmet on-site dining as well as on-site banking, shopping, hair care and excursion assistance. Guests also receive complimentary access to the spa and gym at the on-site spa and health center. The hotel’s event space features 8 meeting rooms, many with plasma screens and videoconferencing, for polished conferences and personal events. For over 50 years, the Radisson Blu Saga Hotel, Reykjavik has provided memorable visits and events with impeccable service. 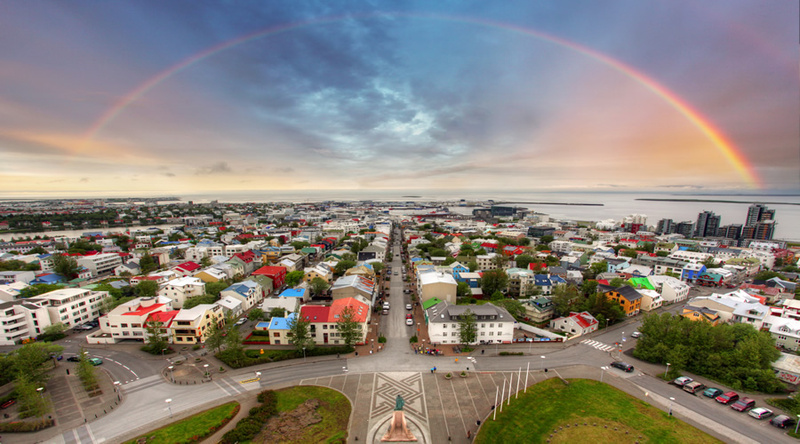 Reykjavik, the world’s most northern capital city, provides a dazzling blend of compact cosmopolitan charm, contemporary design, natural splendor and boisterous nightlife. 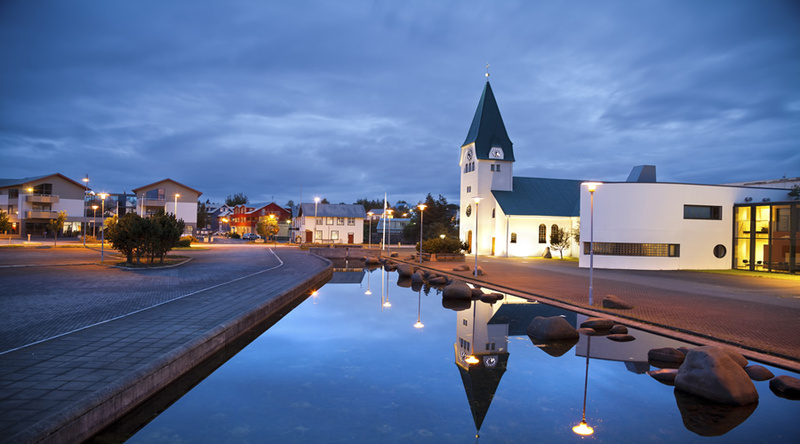 Situated near the city center, our hotel in Reykjavik places guests near this thriving city’s museums, restaurants and shops. The hotel sits adjacent to the National Museum and the state-of-the-art University Cinema, and other cultural attractions, like the Nordic House cultural center, are just a short walk away. Reykjavik’s gorgeous countryside draws many visitors with its spectacular geysers, waterfalls and nearby national park, Thingvellir. The Radisson Blu provides ample on-site car parking for those driving to the hotel. Buses run directly from Keflavik International Airport, 45 minutes away, and a city bus stop is located right outside the hotel. 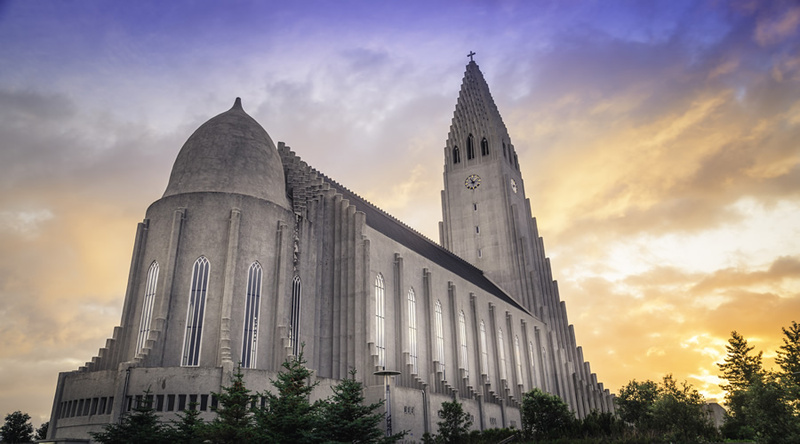 Domestic flights depart from Reykjavik Airport, just 5 minutes from the hotel. In summer, bicycles are available for rent. 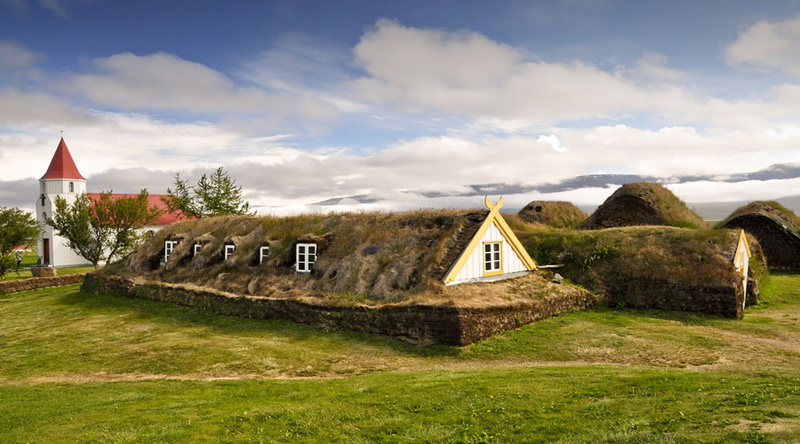 This Iceland accommodation offers a range of lodgings, including kid-friendly and accessible rooms (upon request). All of our 236 rooms and suites feature modern amenities like Free high-speed, wireless Internet, coffee and tea provisions, and complimentary bath products. All guests also enjoy complimentary access to the spa and health centre. 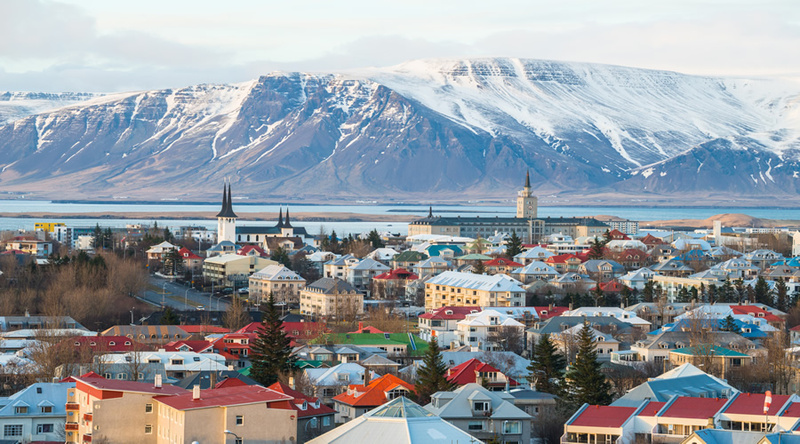 Enjoy a view of the vibrant city centre, the stately campus of the University of Iceland or the beautiful seashore. Approximate room size: 23 m2 | Maximum number of guests: 2 adults The Standard Rooms at this Reykjavik accommodation feature either a Maritime or Scandinavian design. Amenities include an in-room safe and a hair dryer as well as access to the hotel’s wellness centre. Approximate room size: 27 m2 | Maximum number of guests: 2 adults The Superior Rooms are equipped with a king-size bed and allow our guests to wake up to stunning views of Reykjavik each morning. With additional space and extra features, the Superior Rooms offer guests a relaxing stay. Put on a comfy bathrobe and slippers and unwind with a cup of fresh Nespresso® coffee. The hotel offers 3 venues for delicious on-site dining. Regarded as one of the city’s best buffets, our Super Breakfast Buffet is served each morning. Guests can enjoy a delicious buffet for other meals at the cozy Restaurant Skrudur. The recently remodeled Grillið still retains the best panoramas of Reykjavik. The restaurant’s award-winning chefs craft unforgettable gourmet dinners with fresh, local ingredients. Representing Iceland, Head Chef Sigurður Helgason ranked 8th in the prestigious Bocuse d´Or competition in Lyon in 2015. Hotel Fron is committed to providing our guests with an excellent standard of service and a warm and welcoming environment. All our staff are at your service and will be happy to assist you with recommendations or booking day tours or a car. The hotel serves a hearty breakfast every day between 6:30am and 9:30am. Hotel Fron offers free Wi-Fi; the access code is available at the front desk. The hotel offers computers for rental, daily dry cleaning service, meeting facilities. Parking is available by request and a daily fee. 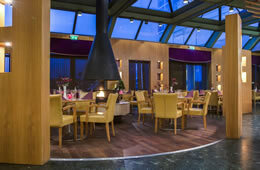 The hotel’s restaurant and bar is Scandinavian offers variety of Nordic dishes. Luxurious apartments for up to three persons. Very stylish and comfortable, the apartments are fitted with parquet flooring, a kitchenette, two single beds and a sofa bed for the third person. The en-suite bathroom is beautifully tiled and includes a shower.The apartments are equipped with a safe to store valuables, a minibar, satellite TV, free high-speed Internet access,direct-dial telephone, hairdryer. Very elegant and stylishly furnished apartments, fitted with a kitchenette, parquet flooring and an attractively tiled en-suite bathroom with a shower. The bedroom can accommodate up to three people. Each apartment comes with both a double bed and a sofa bed for the third person, in addition to a safe deposit box, a minibar, satellite TV and a direct-dial telephone, hairdryer and free high-speed Internet access. The two-bedroom apartments consist of three sleeping quarters and are fitted with a kitchenette, a dining room and a parquet-floored living room. The en-suite bathrooms are tiled and feature a shower and hairdryer. Other en-suite facilities in the rooms include a direct-dial telephone, a safe to store valuables, satellite TV and free Wi-Fi. The Penthouse Apartments with a beautiful terrace overlooking Reykjavik. The penthouse apartments are elegantly furnished two bedrooms with large queen beds suitable for two couples or a family. The apartment is decorated in a modern Scandinavian style with parquet flooring, a kitchenette, a bathroom and a living room. The en-suite bathroom is stylish with a walk-in shower and equipped with a hair-dryer. The penthouse apartments are equipped with a safe to store valuables, a minibar, satellite TV, direct-dial telephone and a free high-speed Internet access. We know that you that your holiday is important to you and that you will have many questions about the destination, the accommodation, how the booking process works and what guarantees you have. We have tried to provide the answer to the most Frequently Ask Questions below. If you have a particular question that we have not thought of, please let us know - We're happy to help. How can I book this holiday? Simply click on the "Enquire Now" button which will take you to our online enquiry page. You will be able to select various options such as which airport you would like to fly from and dates of travel and tell us about any particular requirements you have for your holiday. You will have a dedicated Travel Consultant who will initially send you a quote by email and then continue to work with you to ensure that we meet all your requirements and provide the highest level of service. If you are happy with the quote you have received, simply send a reply email with the names of the passengers travelling and we will begin the booking process immediately. If, once you receive your quote, there is something you would like to change then smiply let us know. Remember - We're always Happy to Help! Why can't I book directly online? There are so many different options available for any particular holiday that provide opportunitie for a more cost effective price or upgrades with certain hotels that you might miss out on a better deal. We strongly believe that a real person is better able to make intuitive decisions about a holiday enquiry than a computer programme that will not have the same dedication or commitment to providing the best possible service. ALSO, why should you waste your time searching for a great deal when we can do it for you - with a personal touch. Rest assured, you will always be dealing with a real live person and you will have direct contact with the same person all the time. You will never have to deal with an anonymous person in a call centre. How much time do I have to respond to a quote I have received? It is our absolute, number one, priority to ensure that you are happy with the details of your holiday before you book and it is important that you have the time to do this. It is also important to remember, however, that prices change all the time (particularly the cost of flights) and it is with this in mind, that we would urge you to try and confirm the booking as soon as possible. We will provide a quote according to your enquiry for the best prices on the day. Communication is the key to getting the best deal and we will work to ensure that we respond to your requests as quickly as possible to guarantee the best prices for you. Can I choose different hotels to the ones recommended on this page? If you have heard about a certain hotel or you have a particular hotel in mind where you would like to stay, simply let us know if the "Comments" section at the end of the online Enquiry Form (Enquire Now) and we will be pleased to check availability and include this in your quote. What happens if I don't like the hotels you have recommended in your quote? The simple answer is "...just let us know." It is impossible for us to send you a quote for every possible hotel option so we usually provide a choice of two or three different hotels in each quote. We are always happy to provide you with other choices and the more information you can give us will help us in finding that sought after hotel that is "Just Right". How do I pay for my holiday and is my money safe? We have several very simple and straightforward methods available for receiving payment. The most popular method is for us to give you a quick call, answer any final questions you might have, and take a debit or credit card payment. If you prefer, we are able to send you a Client Paymet Form that can be completed and emailed back to us. We are also able to take payments by direct bank tansfer and would be pleased to send you our bank details on request. All monies paid to us are protected under the ATOL protection scheme. Our license number is 4705 which can be independently verified. More information about the ATOL protection scheme and how your money and holiday is protected can be found on our About Us page. How do I know if my booking is accepted or confirmed? As soon as we have received payment of your deposit, we will immediately begin confirming all the relevant flights, accommodation, tours and any other services. Once your initial documentation becomes available in the booking system (usally within two hours of receiving your deposit) we will email this to you. Your initial documents will usually include a Receipt, Confirmation of Booking, Flight Confirmations and Confirmation of Accommodation Reservations. Occasionally, emails which contain attachments can be delayed or filtered out by your email provider. If you have not received your documents from us within 24 hrs, please let us know and we can resend them. Most people think of snow and the Northern Lights when they think of Iceland. 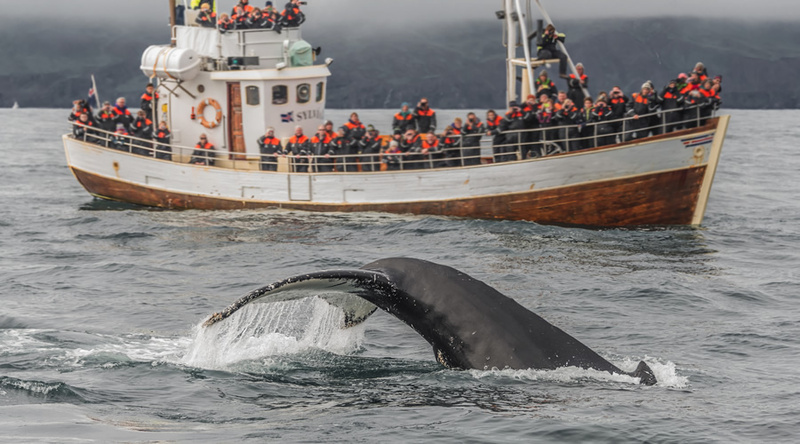 In the summer, Iceland is a very different place with a fabulous of exciting locations and places of interest available to visit that it presents the opportunity for a vast array of different programmes - far more than we can easily show on this page. 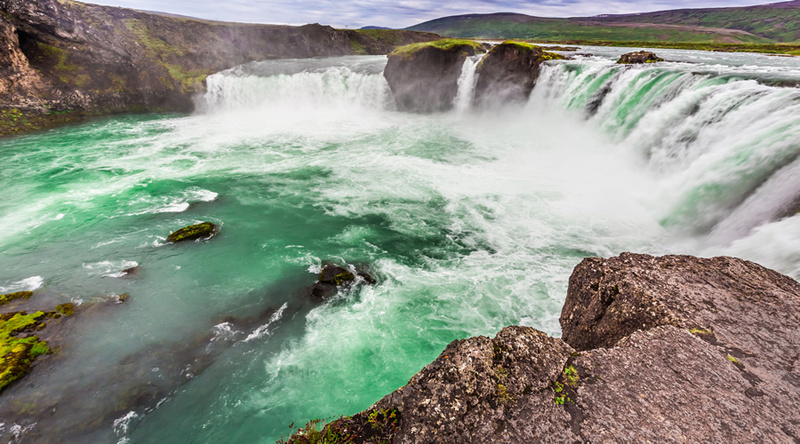 The following Itinerary focuses on Iceland in the summer and we have suggested a programme that vists the most spectacular scenery and provides the best possible insight into the way of life in Iceland. We are pleased to adapt our suggested itineries to your interests and requirements and would be delighted to work with you in developing the most suitable programme that will enable you to make the most out of your time in Iceland. As a starting point, we have shown a proposed itinerary below to help you start planning your trip. Free Time - At Leisure to explore your locality and acclimatise to the Icelandic weather. Visit the amazing South Shore of Iceland crossing fertile farmlands with striking views over waterfalls, glaciers and beautiful nature. It’s a great way to spend a day in Iceland. Pick-up from hotel for your Golden Circle Tour. This popular route should not be missed on your Icelandic vacation. Visit Thingvellir National Park, a UNESCO World Heritage Site, the Gullfoss waterfall as well as the famous Geysir geothermal area. These incredible attractions are a must see! Drop-off at hotel (or nearest point) at end of the tour. 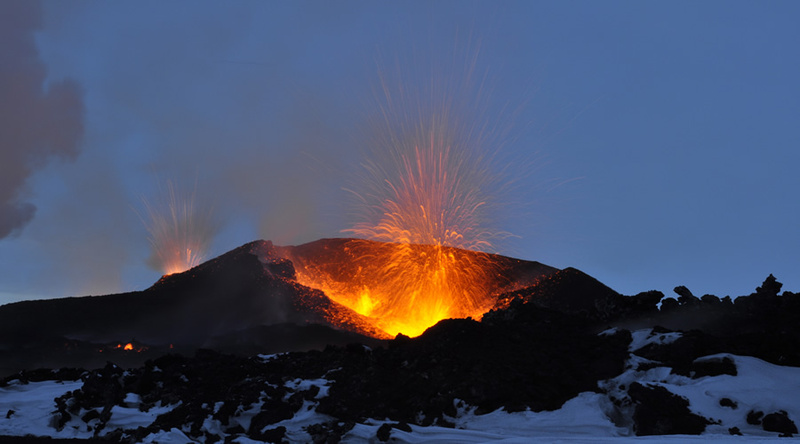 Explore the Reykjanes peninsula, one of the most volcanically active and geologically interesting areas in Iceland. At the end of your trip you have three different options; a visit to the Blue Lagoon, transfer to Keflavík Airport or return back to Reykjavik. Enjoy a peaceful time at the Blue Lagoon, a unique natural pool of mineral rich geothermal water located in the middle of a lava field in the pure, beautiful Icelandic wilderness. A bus will pick you up from your hotel and transfer you to the Blue Lagoon. After bathing in the Blue Lagoon the Flybus will ultimately stop at BSI bus terminal, you will then be redirected to smaller shuttles that will take you to your accommodation. It is possible to extend your holiday by as many days as you wish – Please let us know in the online enquiry form.